While we love exploring beautiful homes for inspiration and pleasure, it's also important that we learn a thing or two from the places that we visit. Each project is a wonderful example of how we too can create beautiful homes that are stylish, trendy and unique. Today, we are going to visit South Korea where interior design professionals, MID, designed a gorgeous home that will teach us a thing or two. In fact, as we explore each room, we will see how we can incorporate little tips and tricks into our own homes to achieve the same fabulous results. Before we've even set foot through the door of this home, we come across a very sleek and impressive entrance. A light and sun-filled hallway with cream tiled floors and white walls leads up to a glass front door, which is decorated by a solitary wreath of flowers. This is a very minimalist and simple design, yet it truly packs a punch. The abundance of light ensures that the entrance is always warm and welcoming, while the light colour palette keeps this space looking spacious and bright. 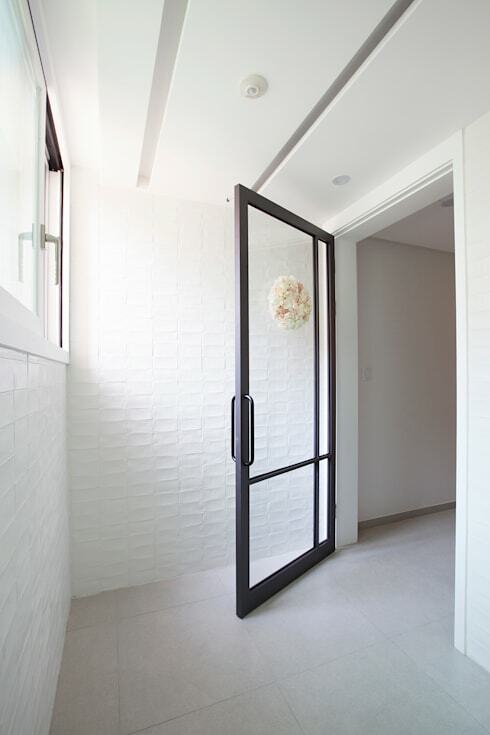 The transparent door creates an easy transition between the interior and exterior of the home, so that guests always feel welcome. A touch of flowers brings in a subtle and natural decorative element. 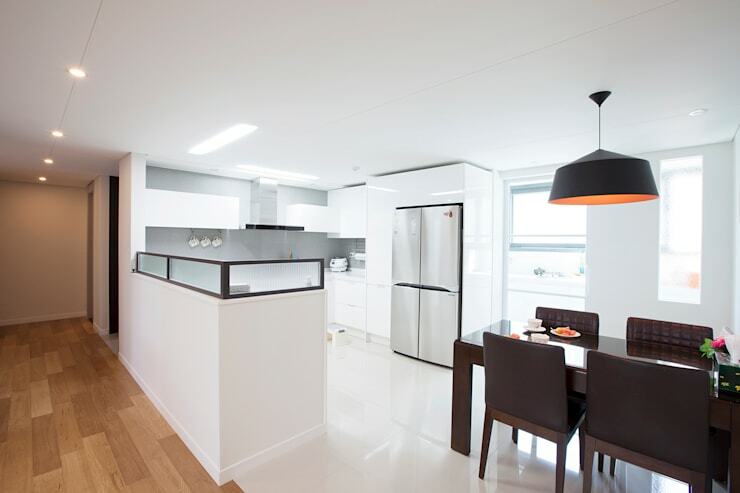 If we head into the home, we can see how the designers used an open plan design, with the rooms flowing into one another. 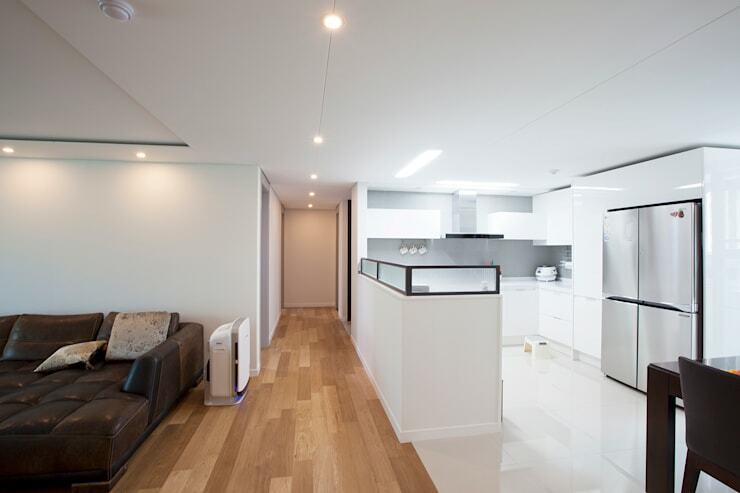 On the left, we have warm wooden floors, which make up the base of the living room, while on the right we have slightly slicker white tiles, which form the base of the kitchen and dining room. The different materials clearly separate the living spaces, without constricting the flow of the open plan design. The wooden floors are also great for the living room, as it creates a warmer and more homely environment. The tiles are better for the kitchen as they allow for a cleaner and more hygienic looking environment. They are also very easy to manage in a space where there is cooking going on! If we look at the living room a little bit more closely, we can see how the designers have ensured that the room is flooded with natural light. The large glass doors and windows that run along the entire length of the far wall ensure that sunshine flows in, while the designers have also installed skylights in the ceiling. This makes for a very homely, warm and light space. The designers have gone for a minimalist look and feel throughout the interior, including only the most functional items in the home. 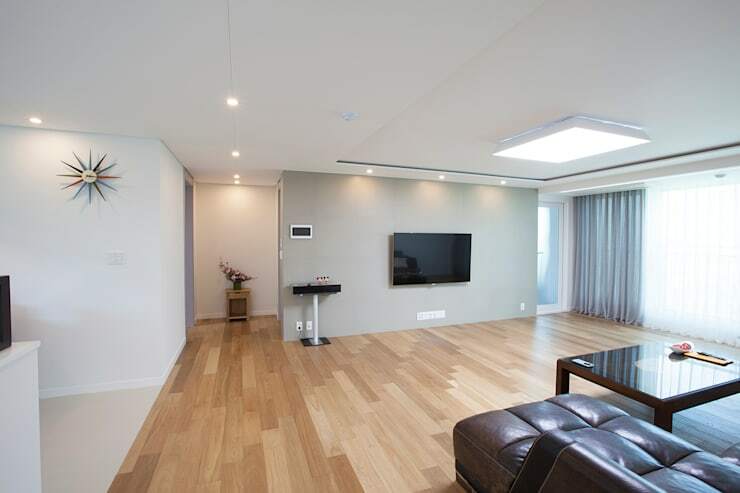 We can see that there is a sleek flat screen television, sofas and a table in this space. This is all that is needed! On the right-hand side of the living space, we come across a little dining room. It features chocolate brown furniture and a very trendy lamp that drops down from the ceiling over the table. These warm colours contrast beautifully with the stark white kitchen, while the dining room is still close enough to the cooking area so that there is a wonderfully social and interactive environment created. Lighting is key to a good dining room as you want to create ambiance and perhaps even romance. Opt for a lamp like this one, which will drop down, providing enough functional light while still giving the room a soft glow. 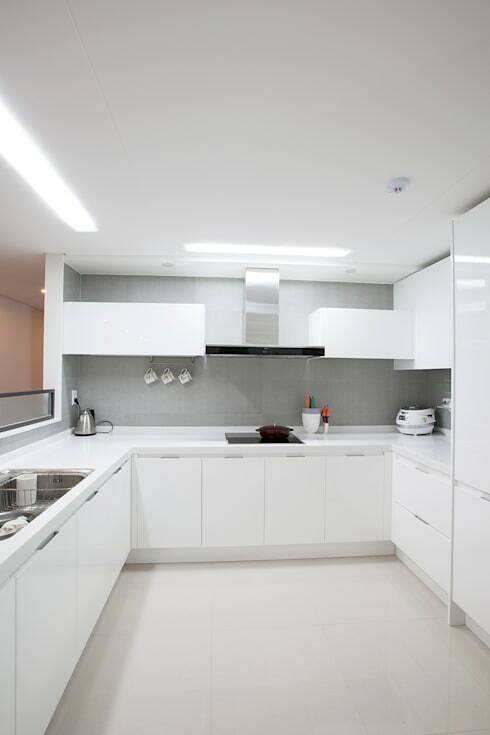 In this image, we can see how effective a white kitchen can be, especially with a minimalist design! The designers utilized the kitchen cupboards and drawers, ensuring that nothing unnecessary has been left on the counter tops. This makes for a very organized and appealing cooking area. It is like a blank canvas, where culinary delights are just waiting to be conjured up! Some people prefer a bit of colour or charm in their kitchen, while for others this simple design is very effective. Have a look at these 10 all white kitchens to see if a white kitchen could work in your home. 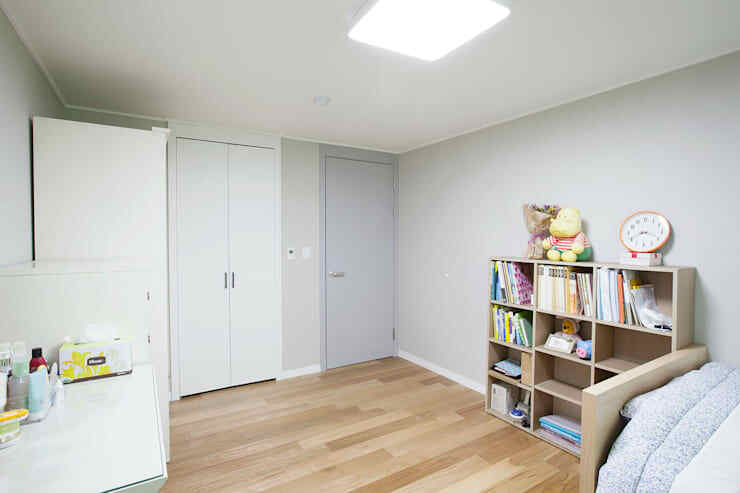 If we poke our heads into the kid's bedroom, we can see that storage space is prominent throughout the house. In this room, a bookshelf keeps toys, books and accessories neatly arranged, while still keeping them on display. This brings some personality, colour and charm to the room. The designers have kept the colour palette neutral, opting for soft wooden floors and pastel tones. The light lavender walls are complemented by the patterned linen, while the white cupboards and shelves create a break in the tones. In this bedroom, we can see how the designers have maximized every square inch of space available to them. They've managed to fit in two dressing tables for storing clothes and personal accessories, a bed and a little home office nook. This is a perfect example of how style and functionality collide. 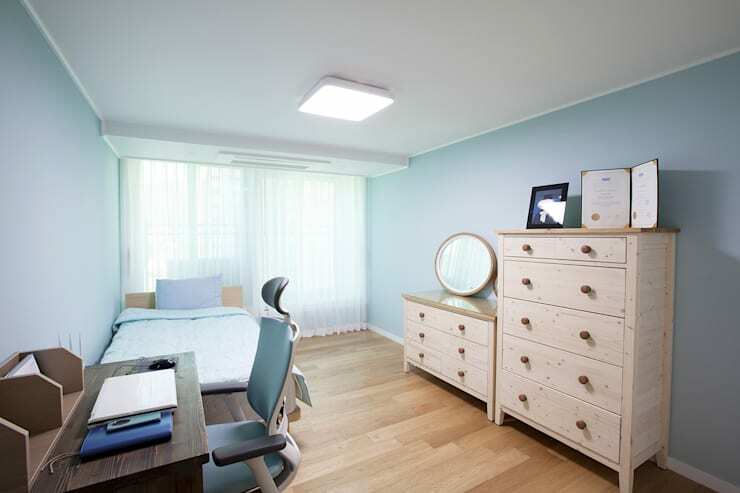 You'll notice that there are some family photographs in this bedroom as well as a certificate or award. This is a great design tip! Your home should reflect your personality and interests so don't be afraid to decorate it with a few family photographs or items that are meaningful to you. Often in bathrooms, we end up with our personal products littered all over the counter tops, showers and baths. This doesn't make for a very appealing space, especially when visitors come to stay! Your bathroom should be a serene and tranquil space, devoid of clutter and chaos. This is why it is so important to invest in smart storage solutions in your bathroom, where you can keep items neatly out of sight. 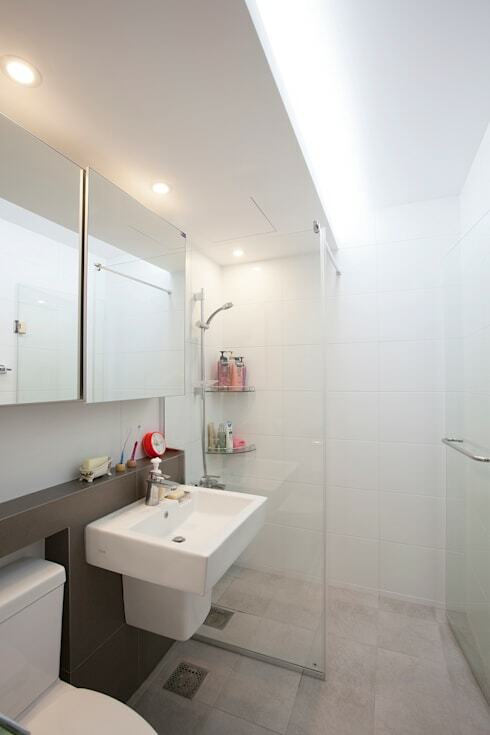 In this bathroom, we can see how the designers have installed a medicine cabinet, with cupboards hidden behind the mirror. This is a savvy design trick! In the shower, there are also shelves, which keep shampoos and soaps neatly organized, while easily accessible.